In the international year ‘Mondriaan to Dutch Design’, and on occasion of the 100th anniversary of De Stijl, the museum showcases the special exhibition The patron and the ‘house painter’. Helene Kröller-Müller and Bart van der Leck. The Kröller-Müller Museum is one of the treasure troves of De Stijl. With masterpieces by Piet Mondriaan, Theo van Doesburg, Bart van der Leck and Gerrit Rietveld among others, De Stijl is one of the the Kröller-Müller Museum’s specialties. The foundation for this was laid by Helene Kröller-Müller, the founder of the museum. She even had an agreement with Van der Leck by which he gave her the right of first refusal on his work for several years. This led to an impressive collection of Van der Lecks: forty-two paintings and about four hundred drawings. This exhibition shows a selection of the paintings and drawings from the collection. Van der Leck’s development is clearly illustrated, as seen from the perspective of Helene Kröller- Müller. Using the many letters they exchanged, her thoughts are presented and the exhibition shows how the new work is related to the rest of her collection. 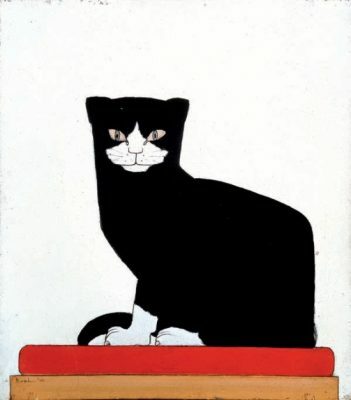 Bart van der Leck was born in 1876 in Utrecht, son of Bart Anthonij van der Leck (a painter and decorator) and Hendrika Gathier. In Utrecht he worked in various glass workshops from 1891 to 1896. In 1904 he graduated from the National School for the Arts, with the comment ‘very great artistic skill in designing figurative and ornamental compositions, especially glass paintings’. In 1908 he concluded his first contract with the collector Hendrik Bremmer. Van der Leck sends him drawings, which Bremmer sells to his students. In 1912 Van der Leck concludes a contract with Bremmer, with Helene Kröller-Müller as silent partner. In exchange for a fixed salary, all work produced by Van der Leck becomes the property of Bremmer. Until 1918 Van der Leck receives a yearly subsidy from Helene Kröller- Müller. Thus, she becomes Van der Leck’s maecenas. In 1914 the artist starts to work directly for the transport company Wm H. Müller & Co, owned by Helene’s husband. Helene and Van der Leck met for the first time in the company offices on 22 February 1914. Helene gives Van der Leck a commission to design a stained-glass window for the staircase in the head office of Müller & Co. To see the mines owned by the company, Van der Leck goes on a study trip to Algeria and Spain. He also receives the assignment to design a poster for the ‘Batavierlijn’, the company’s passenger branch. In 1915 and 1916 Van der Leck lives in The Hague. Working for Müller & Co, he makes designs for the colour scheme of the interior of Holland House in London. He also gives advice on colour schemes for the stately homes Groot Haesebroek and Wildrust in Wassenaar. He often collaborates with the architect H.P. Berlage, who builds several objects for the company from 1913 to 1919. In February 1916 Van der Leck expresses his dissatisfaction with the commissions he receives from Helene, on which he works with Berlage. Van der Leck is usually asked to paint interiors, but this makes him feel like his talents are not appreciated. He feels like a ‘house painter’ rather than a real artist. He asks for his contract to be annulled. Bremmer concludes a new contract between Helene and Van der Leck, which, among other conditions, allows him to live outside of The Hague. In this time he creates his paintings Work at the Docks and The Tempest. In April 1916 Van der Leck and his family move from The Hague to De Boschhoek in Laren, where he meets Piet Mondriaan. At Helene’s request, Van der Leck designs a poster for the People’s University of The Hague. In December he finishes Composition 1916, no. 4, better known as Mytriptych. Helene finds it difficult to appreciate this abstract ‘line art’, as she calls it. She asks Van der Leck to send his studies for the work, so she might understand it better. Despite Helene’s objections, Mytriptych is exhibited immediately in the Museum Kröller, the office of Müller & Co at the Lange Voorhout in The Hague. The artists Theo van Doesburg and Vilmos Huszár see the painting there and are very impressed. They see Van der Leck as a great innovator. Both Mondriaan and Van der Leck are searching for their artistic identity in this period, but they work steadily and arrive at revolutionary innovations. 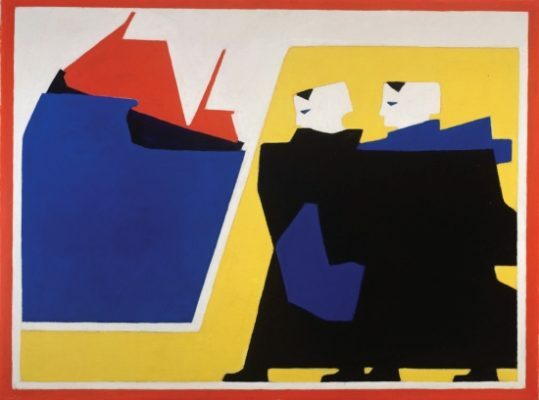 Van der Leck simplifies shapes in his paintings and radically reduces colour in his works, to only the primary colours. Led by Van Doesburg, Van der Leck and Mondriaan are part of the foundation of the artistic movement De Stijl in 1917. Contrary to the others, Van der Leck wants to aim the associated journal at painters only. In 1918 Van der Leck refuses to sign the first manifesto of De Stijl, which creates a rift between him and Van Doesburg. In February of the same year, Van der Leck cancels his contract with Helene, through Bremmer’s mediation, citing a lack of appreciation for his work. In her 1925 Reflections, Helene calls him ‘a more versatile and powerful artist than Mondriaan’. In 1927 Helene Kröller-Müller organizes an exhibition in her museum showing works by Bart van der Leck exclusively. The maecenas and the ‘house painter’ is open from 14 October 2017 to 2 April 2018. The Kröller-Müller Museum is a second home to Vincent van Gogh. The museum boasts almost 90 paintings and more than 180 drawings, making it the second-largest collection of Van Goghs in the world. In addition, the museum is home to top works by modern masters including Claude Monet, Georges Seurat, Pablo Picasso and Piet Mondriaan. Temporary exhibitions ensure that the museum keeps pace with all the latest developments and retains public interest. New acquisitions ensure a dynamic collection that follows close on the heels of contemporary art history. The entire spectrum, from Vincent to the present day. The museum is set in one of Europe’s largest sculpture gardens, an outdoor gallery covering 25 hectares, in which modern sculptures blend into the natural background. The garden serves as a backdrop for more than 160 sculptures by prominent artists, from Auguste Rodin to Henry Moore, and from Jean Dubuffet to Joep van Lieshout. The Kröller-Müller Museum is the lifework of Helene Kröller-Müller. Between 1907 and 1922, she and her husband Anton Kröller bought almost 11,500 works of art, thus accumulating one of the largest private collections of the twentieth century. The Kröller-Müller Museum first opened its doors on 13 July 1938. It was designed by the Belgian architect Henry van de Velde. In the 1970s, a wing was added, designed by the Dutch architect Wim Quist. The Kröller-Müller Museum is located in the middle of National Park Hoge Veluwe and is easily accessible by car and public transport.